Phonographic Copyright (p) – Phonogram Records Ltd.
Silver moulded label version can be found here. This single was reissued in 1985 with a different sleeve. Another pressing of this release exists with the 12" Remix pressed onto the A-side. Audibly, this one's a starting point where Tears For Fears were still in search of their own identity. 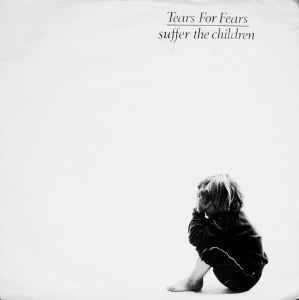 Expecting a more explicit synth-pop version of "Suffer the Children" may be a disappointment to some - as the 1981 7" version is already quite similar to the later album version; the structure remains intact, except the edges are more rough (and to an extent clumsy), leaving this single version innocently floating in its (demo) obscurity. Personally, I prefer the 1983 LP version, which is more upbeat and slicker in production. The b-side "Wino" is this surprisingly acoustic gem of a number Depeche Mode never had. Their 1st single. This version of "Suffer The Children" is not the same as the version that appears on the bands' debut LP "The Hurting"